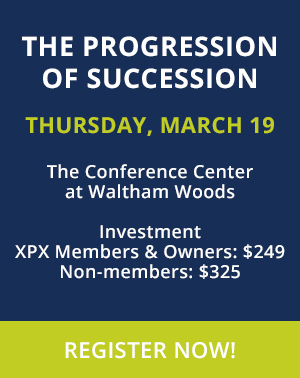 The Exit Planning Exchange (XPX) Boston announces that it will hold its annual Summit on March 19th, 2015 at The Conference Center at Waltham Woods. “The Progression of Succession” is the theme of the 2015 Summit. Well known owners and advisors will share their practical knowledge and experience on preparing for and successfully executing business succession. Topics will include growth capital, ESOP’s, internal ownership transition, management and leadership succession and sale. The Summit will run from 8:00 AM-4:00 PM with a reception afterwards. Keynote speakers include both Boston based and national leaders: Charlie Storey, President of Harpoon Brewery and Warren Dibble, Vice President and CFO; Tim Hebert, President and CEO of Atrion Networking Corporation; Steve Gerard, Chairman and CEO of CBIZ, Inc.; Bob Gross, Senior Managing Director of Prairie Capital Advisors, Inc.; and Kenneth Marks, Founder and Managing Partner of High Rock Partners. The agenda for the summit includes speakers, panels and a fireside chat. This highly interactive format, will allow the business owners and advisors to share personal lessons learned, tips and tricks, and stories regarding the requirements for successful management transition and exit. Terry Phinney, Principal at Blackstone Management and Consulting, is the chair of the 2015 Summit. Terry was named to the XPX (Boston) Board of Directors earlier this year. XPX is committed to improving the process of planning for, positioning, and executing management succession and business exits. Founded in 2008, The Exit Planning Exchange (XPX) has chapters in Boston, Hartford, Philadelphia, DC Metro, Tampa Bay and Baltimore. The Exit Planning Exchange (XPX) Boston offers an unparalleled opportunity for members to expand their professional networks and develop their skills in the field of exit planning. XPX members have access to a broad network of specialists in diverse fields, including accounting, merger and acquisition, business consulting, legal and human systems consulting. To learn more about the Exit Planning Exchange (XPX) Boston or to join, please contact Donna Powell, Administrator, at 978-392-7929, or donna@exitplanningexchange.com.